From the outset it is quite obvious that when we speak about fasting we are referring to some type of physical abstinence from food and drink. Yet before we begin to answer the question "How do we fast?" we must remember that the rules about eating and drinking must never be treated as an end in themselves, for ascetic fasting always has an inward and unseen purpose*. The primary aim of fasting is to make us conscious of our dependence upon God and to bring us to the point where we appreciate the full force of Christ's statement, "Without me you can do nothing" (John 15:5). When we speak about fasting it is misleading to focus only on the element of weariness and hunger. Fasting leads, not merely to this, but also to a sense of lightness, wakefulness, freedom and joy. Even if the fast proves debilitating at first, afterwards we find that it enables us to sleep less, to think more clearly, and to work more decisively. While involving genuine self-denial, fasting does not seek to do violence to our body but rather to restore it to health and equilibrium. Fasting liberates our body from the burden of excessive weight and makes it a willing partner in the task of prayer, alert and responsive to the voice of the Holy Spirit. Fasting is not a mere matter of diet. It is moral as well as physical. True fasting is to be converted in heart and will; it is to return to God, to come home like the Prodigal to our Father's house. In the words of St. John Chrysostom, it means "abstinence not only from food but from sins." "The fast," he insists, "should be kept not by the mouth alone but also by the eye, the ear, the feet, the hands and all the members of the body": the eye must abstain from impure sights, the ear from malicious gossip, the hands from acts of injustice. It is useless to fast from food protests St. Basil, and yet indulge in cruel criticism and slander: "You do not eat meat, but you devour your brother." The inner significance of fasting is best summed up in the triad: prayer, fasting, almsgiving. Divorced from prayer and from the reception of the holy sacraments, unaccompanied by acts of compassion, our fasting becomes hypocritical. It leads, not to contrition and joyfulness, but to pride, inward tension and irritability. Fasting, then, is valueless or even harmful when not combined with prayer. In the Gospels the devil is cast out, not by fasting alone, but by 'prayer and fasting' (Matthew 17:21; Mark 9:29); and of the early Christians it is said, not simply that they fasted, but that they 'fasted and prayed' (Acts 13:3). It is also important that prayer and fasting be accompanied by almsgiving - by love for others expressed in practical form, by works of compassion and forgiveness. It means not to give only of our money but our time, not only what we have but what we are; it is to give part of ourselves. In our acts of abstinence we should try to keep in mind St. Paul's admonition not to condemn others who fast less strictly: "Let not him who abstains pass judgement on him who eats." We must equally remember Christ's outward condemnation of outward display in prayer, fasting or almsgiving as seen in the Gospel of Matthew (6:1-18). Fasting is meant to be an act of obedience. When we fast, we should not try to invent special rules for ourselves, but rather we should try to follow as faithfully as possible the accepted pattern set before us by Holy Tradition. This accepted pattern possesses a hidden wisdom and balance. When it seems that the traditional regulations are not applicable to our personal situation, we should seek the counsel of our spiritual father in order to humbly discover with his help what is the will of God for us. While all Orthodox Christians should fast, each person and family must prayerfully choose and commit themselves to a fasting discipline that is suitable to their circumstances and that they can keep. Many chose to fast from meat on Wednesdays and Fridays throughout the year and then adjust their fasting practices during the other fasting periods of the Church. 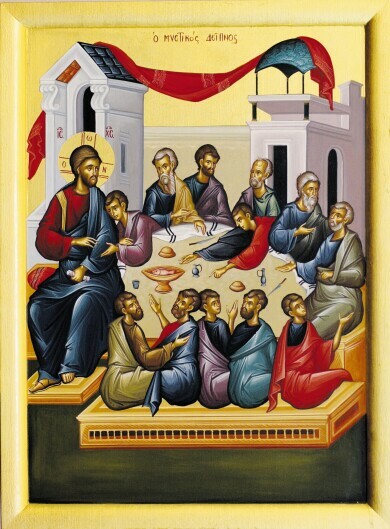 Some choose to fast strictly (no meat or dairy products) throughout Great and Holy Lent. Many choose to fast strictly only during the first week of Lent and during Holy Week. Others choose to fast from meat throughout Lent and from meat, fish and diary products only on Wednesdays and Fridays. Still others follow other forms of fasting disciplines. Children usually fast with moderation and care in order to receive the necessary nutrients for their growing bodies. Of course fasting regulations do not apply to people who are ill, in hospitals, to expectant mothers, to small children or to others following special diets under a doctor's care. If you still have any questions concerning fasting please direct them to Father Peter. Every Wednesday and Friday is to be observed with fasting unless some important feast takes precedence over the fast (see exceptions below). The fast on Wednesday is in memory of the betrayal of the Lord, and the fast on Friday is in remembrance of His Passion and Death upon the Cross. (These are stict fast days in which holy tradition teaches us that we should fast on these days from meat, meat products, fish, dairy products, olive oil, and wine). Lent begins the forty days before Palm Sunday, on the Monday after Cheese-Fare Sunday, and lasts until the evening preceding Palm Sunday. HOLY WEEK is a special fast in honor of our Lord's Passion and lasts from the evening of Palm Sunday through Holy Saturday. The Fast of the Holy Apostles begins on the Monday after All Saints' Sunday (the Sunday following Pentecost) and lasts until June 29, the Feast of the Holy Apostles Peter and Paul. The fast varies in length according to the date of Pascha. The fast which precedes the Feast of the Falling asleep of the All Holy Theotokos begins on August 1 and lasts until August 14. The fast before Christmas begins on November 15 and lasts until December 24.